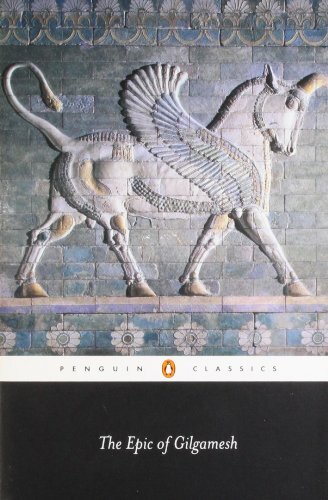 The Epic of Gilgamesh, an epic poem from Mesopotamia, is considered the world’s first truly great work of literature. The literary history of Gilgamesh begins with five Sumerian poems about ‘Bilgamesh’ (Sumerian for ‘Gilgamesh’), king of Uruk. These independent stories were used as source material for a combined epic. The first surviving version of this combined epic, known as the “Old Babylonian” version, dates to the 18th century BC and is titled after its incipit, Shūtur eli sharrī (“Surpassing All Other Kings”). Only a few tablets of it have survived. The later “Standard” version dates from the 13th to the 10th centuries BC and bears the incipit Sha naqba īmuru (“He who Saw the Deep”, in modern terms: “He who Sees the Unknown”). Approximately two thirds of this longer, twelve-tablet version have been recovered. Some of the best copies were discovered in the library ruins of the 7th-century BC Assyrian king Ashurbanipal. The first half of the story discusses Gilgamesh, king of Uruk, and Enkidu, a wild man created by the gods to stop him oppressing the people of Uruk. After an initial fight, Gilgamesh and Enkidu become close friends. Together, they journey to the Cedar Mountain and defeat Humbaba, its monstrous guardian. Later they kill the Bull of Heaven, which the goddess Ishtar sends to punish Gilgamesh for spurning her advances. As a punishment for these actions, the gods sentence Enkidu to death. In the second half of the epic, Gilgamesh’s distress at Enkidu’s death causes him to undertake a long and perilous journey to discover the secret of eternal life. He eventually learns that “Life, which you look for, you will never find. For when the gods created man, they let death be his share, and life withheld in their own hands”. However, because of his great building projects, his account of Siduri‘s advice, and what the immortal man Utnapishtim told him about the Great Flood, Gilgamesh’s fame survived his death. His story has been translated into many languages, and in recent years has featured in works of popular fiction. Some of you may be familiar with the text because it was required reading in high school (and certain colleges), and while at the time of study it may have had a different significance, if approached with an alchemical understanding, we can learn a lot about life, death, reincarnation and the destiny of man’s evolution. The three specific passages below, in particular, are worth revisiting with a new understanding. The past shaped our present, but also shapes our future. Grasping the knowledge of the ancients is key in our guided ascension. To learn even more, look to the work of Joseph Campbell to unlock an even higher level of gnosis.